We know from verse 42 that “evening approached”. According to Jewish time keeping, the Sabbath started at 6pm, when all work was not allowed, hence the urgency to get Jesus body into a tomb. I have set this scene at about 5-5:30pm. The setting sun (unseen, on the left) is bathing this scene in strong red/orange light. Joseph of Arimathea is carrying a candle lantern, which also provides a yellow light; it can be seen reflecting off various characters present in this scene. 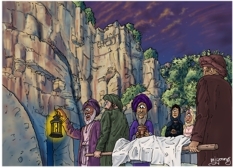 From left to right: Joseph from Arimathea (in purple) holding a lantern up before the tomb, two servants carrying the covered body of Jesus on a stretcher. Nicodemus is in the background, holding a jar. Mary Magdalene and Salome are also in the background. John – son of Zebedee & Mary (the mother of James the younger/less and of Joseph/Joses) (see verse 40) who have been in previous scenes, are not visible in this particular one. There are two versions of this scene, this one (the Colour version) & the alternate (the Sunset version) which is on the next page. 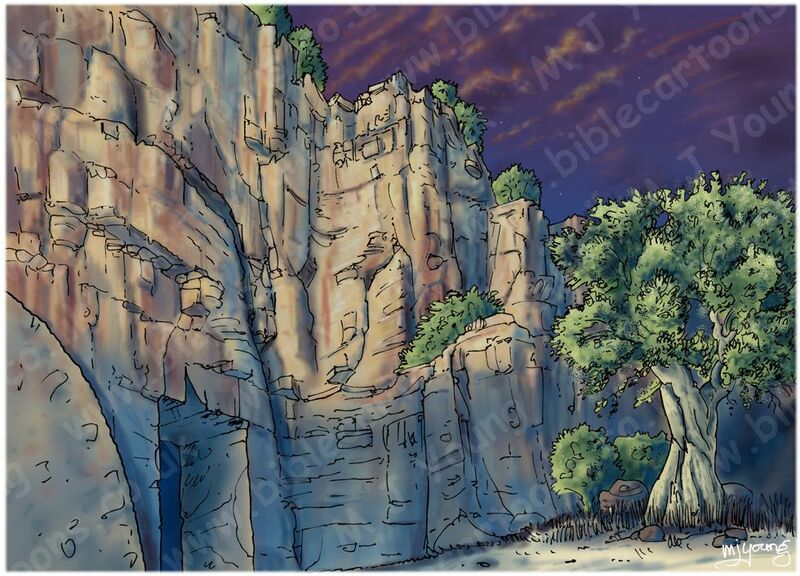 In this Colour version I have concentrated on creating cooler limestone rock colours, with blue shadows & greens in the foliage of the olive tree & bushes. I did this to indicate the failing light, as the sun goes down. Lower light levels (as dusk approaches) tends to reduce tonal contrasts. On the other hand, in the next scene (The Sunset version) I have included a strong setting sun (off to the left) which is throwing powerful oranges, yellows & reds into the scene. The focus of attention is the strong colours within the scene, which contrast with the pale linen covering over Jesus’ body. I have included both versions to cater for different customer needs: some people like brighter colours, so people are after more atmospheric lighting. 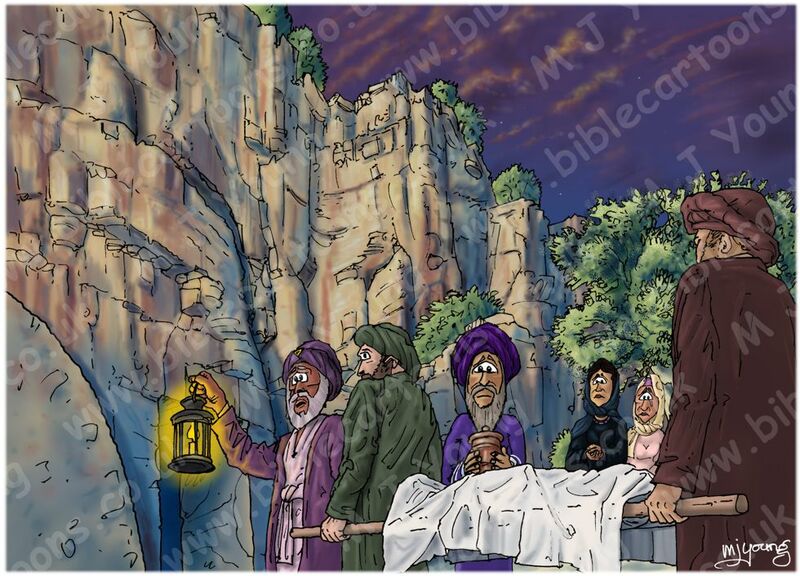 Joseph from Arimathea is holding a lantern up, to light the way for the servants to carry Jesus’ body into the tomb. You can see the rectangular tomb entrance carved into the rock, behind Joseph. Notice that Nicodemus is carrying an earthenware jar, which might contain aromatic herbs & spices to be placed around the body of Jesus. Notice the large round stone (only partially visible in the lower left of the scene) which will be rolled over the entrance to the tomb, once Jesus body is placed in it. Where was the tomb in which Jesus’ body was laid? There are several locations proposed by various people for the site of the tomb of Jesus. It seems that no-one is entirely certain where it is. For this reason I have drawn an unspecified limestone cliff, into which the tomb is carved. 01) Church of the Holy Sepulchre, Jerusalem. 02) Garden Tomb, discovered in the 19th century outside of the old city of Jerusalem. 03) Talpiot Tomb, rock-cut tomb in the East Talpiot neighborhood, five kilometers south of the Old City in East Jerusalem. 04) The Mount of Olives. The Church of the Holy Sepulchre1 (Arabic: كنيسة القيامة‎, kanīssat al Qi’yāma; Latin: Sanctum Sepulchrum; Hebrew: כנסיית הקבר הקדוש‎, Knesiyat HaKever HaKadosh) also called the Church of the Resurrection by Orthodox Christians (Armenian: Սուրբ Յարութեան տաճար, Surb Harut’ian tačar; Greek: Ναός της Αναστάσεως, Naós tēs Anastáseōs), is a church within the Christian Quarter of the Old City of Jerusalem. It is a few steps away from the Muristan. The site is venerated as Calvary (Golgotha), where Jesus of Nazareth was crucified, and also contains the place where Jesus is said to have been buried. Within the church are the last four (or, by some definitions, five) Stations of the Cross along the Via Dolorosa, representing the final episodes of Jesus’s Passion. The church has been an important Christian pilgrimage destination since at least the fourth century as the purported site of the resurrection of Jesus. Today it also serves as the headquarters of the Greek Orthodox Patriarch of Jerusalem, while control of the building is shared between several Christian churches and secular entities in complicated arrangements essentially unchanged for centuries. Today, the church is home to branches of Eastern Orthodoxy and Oriental Orthodoxy as well as to Roman Catholicism. Anglicans and Protestants have no permanent presence in the Church4 and some have regarded the Garden Tomb, elsewhere in Jerusalem, as the true place of Jesus’s crucifixion and resurrection. The Garden Tomb is a rock-cut tomb in Jerusalem which was unearthed in 1867 and has subsequently been considered by some Christians to be the site of the burial and resurrection of Jesus. The Garden Tomb is adjacent to a rocky escarpment which since the mid-nineteenth century has been proposed by some scholars to be Golgotha (it is also known as Skull Hill, Gordon’s Calvary, and Conder’s Calvary). In contradistinction to this modern identification the traditional site where the death and resurrection of Christ are believed to have occurred has been the Church of the Holy Sepulchre at least since the fourth century. Since 1894 the Garden Tomb and its surrounding gardens have been maintained as a place of Christian worship and reflection by a Christian non-denominational charitable trust based in the United Kingdom named The Garden Tomb (Jerusalem) Association. The Talpiot Tomb (or Talpiyot Tomb) is a rock-cut tomb discovered in 1980 in the East Talpiot neighborhood, five kilometers south of the Old City in East Jerusalem. It contained ten ossuaries, six of them with epigraphs, including one with the inscription that has been interpreted as “Yeshua bar Yehosef” (“Jesus, son of Joseph”), though this text is not well-formed (i.e. it is sloppy) and highly disputed. The tomb also yielded various human remains and several carvings. The Talpiot find was first published in 1994 in “Catalogue of Jewish Ossuaries in the Collections of the State of Israel” numbers 701-709, and first discussed in the media in Britain during March/April 1996. Later in 1996, an article describing the find was published in volume 29 of Atiqot, the journal of the Israel Antiquities Authority. A controversial 2007 documentary film produced by Canadian film director James Cameron and investigative journalist Simcha Jacobovici titled The Lost Tomb of Jesus and a book written by Jacobovici, together with Charles Pellegrino, The Jesus Family Tomb present findings that the authors believe prove that the Talpiot Tomb was the burial place of Jesus of Nazareth, as well as several other figures from the New Testament. This claim is disputed by many archaeologists and theologians, as well as linguistic and biblical scholars. In his website “Golgotha Rediscovered” Rodger Dusatko suggests that the “place of the skull” should be rendered “cranium”, or a hill that looks like a rounded skull-like head. He has found a slope of bare rock that fits that description. Rodger Dusatko explains the connections between the red heifer sacrifice (in the Old Testament) & Jesus’ sacrificial death on the cross in the New Testament. The red heifer was to be sacrificed as part of the purification rites of the Mosaic Law. Numbers 19:1–10 describes the red heifer, from which the water of purificatioon was obtained. The Red Heifer was sacrificed on the Mount of Olives. Bible scholars see the sacrifice of the blood of the heifer (cleansing from sin) as a foreshadowing of the blood of Christ shed on the cross for the atonement of believers’ sin. Jesus was “without blemish” (just as the red heifer had to be) & the heifer had to be sacrificed outside the camp (see Numbers 19:3) in the same way that Jesus was crucified outside of Jerusalem. Hebrews 13:11-12 tell us “And so Jesus also suffered outside the city gate to make the people holy through his own blood”. He also cites the Gospels as saying that the Roman Centurion (et al) SAW the Temple curtain being torn. That would mean that the place of execution of Jesus (where they were standing) must have had line-of-sight to the Temple entrance. The website articles are well worth a read.